Priest House is an early 15th-century half-timbered hall house on the edge of Ashdown Forest, once owned by Lewes Priory. 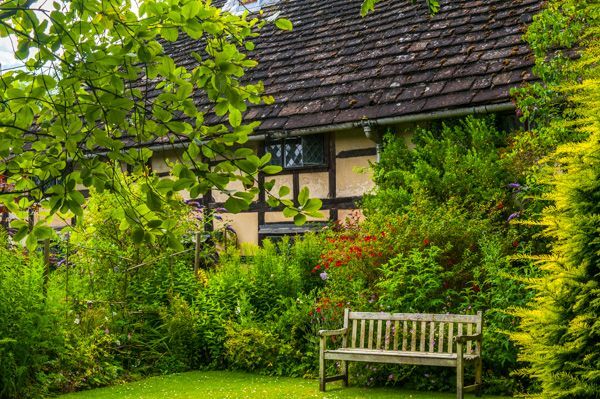 The interior houses a museum of local life, with a traditional cottage garden surrounding the house. 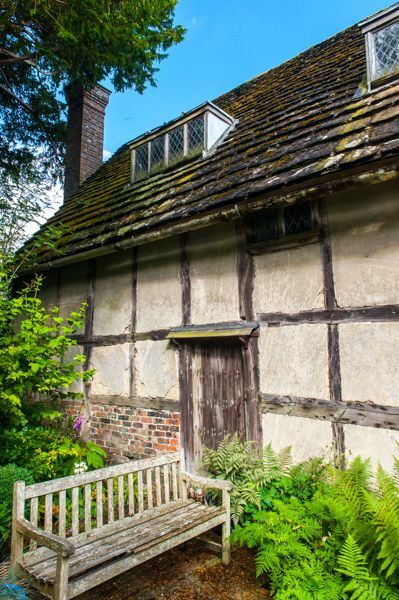 This traditional Wealden hall house is only one of its kind open to the public in the Weald. 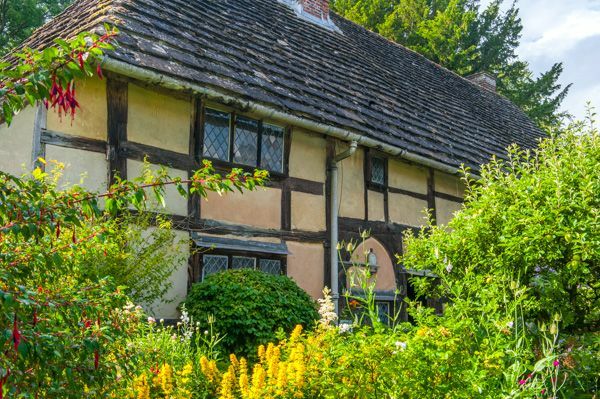 The house was built in the late 15th century for the monks of Lewes, to serve as an estate office for administering the manor of West Hoathly Rectory. It was subsequently owned by some of the most famous names in English history. In 1524 the Priory rented out the manor and the house was turned into a family home for a local farmer named John Browne. When the Priory of Lewes was dissolved by Henry VIII during the Reformation, its property, including Priest House, was seized by the crown. Ownership passed to Henry's Chancellor, Thomas Cromwell, and after his execution for treason, it was granted to Anne of Cleves. When Anne died the estate passed in turn from both Mary I to Elizabeth I. In 1560 Elizabeth sold the estate and the Brownes purchased the old manor lands and the Priest House. The original house was an open hall, with a central hearth. One end of the house had an upper chamber over a living area, while the other end had service rooms below a solar. Sometime in the 16th century, a roof of Horsham stone was added, along with central chimneys to create a house suitable for a prosperous yeoman farmer, with a pair of new rooms upstairs, each with their own fireplace. The Brownes stayed on until 1695, then sold the house and Manor to pay family debts. The Priest House was divided into two small properties and rented out to tenants. For over 2 centuries the house was owned by absentee landlords who allowed it to lapse into disrepair. In the early years of the 20th century, the house was restored and opened to the public as a museum in 1908. In 1935 the Sussex Archaeological Society took control, and today use the house as a venue for a wonderful display of local history, with a special collection of richly embroidered smocks, traditionally worn by local farmers and workmen. Look for witches marks over the kitchen fireplace. These marks were meant to deter witches from entering the house through the open fireplace. The earliest dates to the 16th century, but each generation seems to have added new marks, and the latest dates to the 18th century. Another highlight is the Suffragette Handkerchief, created by women imprisoned at Holloway Prison in March 1912 for their militant protest in favour of women's suffrage. Some 223 women were arrested for breaking shop windows in The Strand and Whitehall in an attempt to force the government's hand and gain equal footing in law for women to vote. Most were sent to Holloway Prison, where the handkerchief was embroidered with the names of 66 women and 2 sets of initials during the limited exercise periods granted to the prisoners. We came to Priest House on a sunny day in June, when the garden was lush and vibrant with colour. 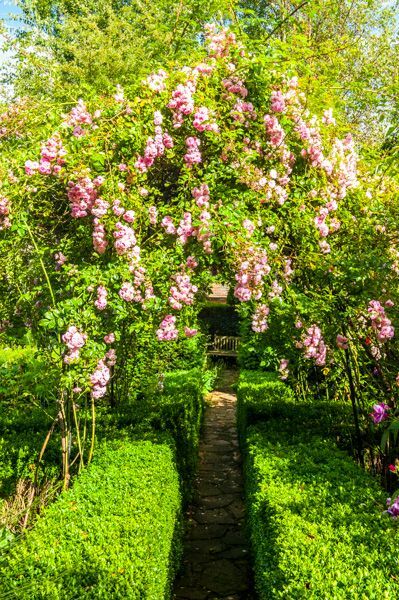 Walking up the overgrown garden path, pushing our way past intruding cascades of flowering shrubs, I felt like we were wandering back in time. 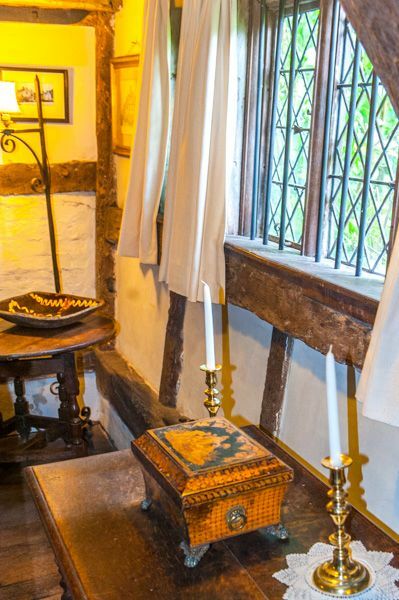 The low entrance door leads into a small parlour, piled high with historic treasures. And that's what the interior of Priest House really is; a delicious jumble of local history, with objects piled on top of historical objects, piles of fascinating tools, textiles, ironwork, household implements, 17th and 18th-century furniture, clothing and general 'bygones' jostling for space. The ground floor is just 2 rooms; the entrance hall with a small hearth, and a much larger chamber with a dining table. From here a set of stairs leads up to 3 more chambers on the first floor. The stair is lined with wonderful examples of embroidered smocks. 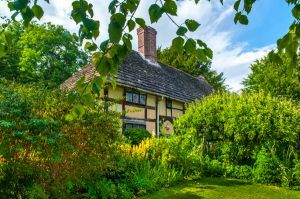 Surrounding the house - and practically overwhelming it in summer - is a small cottage garden, planted with over 170 herbs and flowers used for cooking, medicine, and household uses. 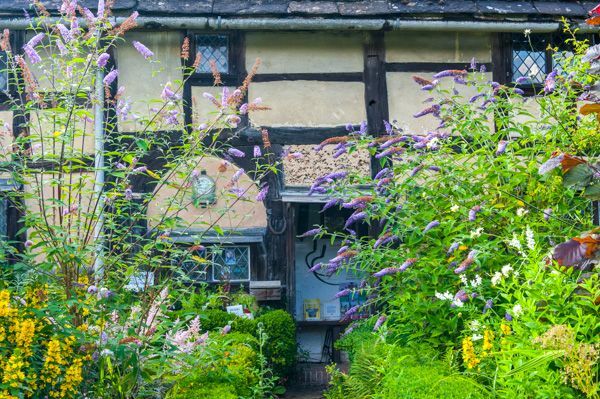 There are colourful shrubs, herbaceous borders, and wildflowers galore. Do take time to visit the lovely medieval parish church of St Margaret, just up the road from Priest House. It is an absolute delight! 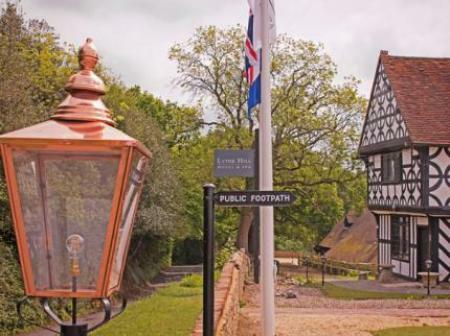 Look for the Manor House, opposite the church, built in 1627, and the Cat Inn, on the corner, built in the early 16th century.